The next time someone tells you the Christian faith, this nation’s founding and its form of government had nothing to do with each other just tell him to take a trip to Washington D.C., and be prepared for a shock! 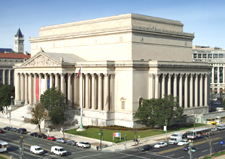 For instance, let’s start at the National Archives building. It’s the repository where any document considered to have some inherent national, historical or research value is preserved. Enter the building and right at your feet is a huge bronze medallion of the Ten Commandments engraved in the floor! Walk around and you’ll see all the great founding documents like the Declaration of Independence with its four references to God, and how man’s rights came directly from God. The original Constitution refers to biblical concepts like the sovereign authority of God, and the rule of law rather than authority of man. The Bill of Rights references the rights of citizens from government interference such as: freedom of religion, not freedom from religion, and private property rights. All of these important documents are sprinkled with Judeo-Christian references. 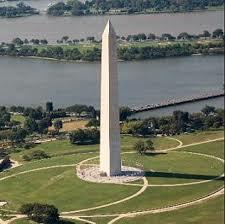 Visit the Washington Monument. After its completion in 1884, a Holy Bible, and copies of the Constitution and the Declaration of Independence were placed inside the cornerstone. On the east side of the capstone, facing the rising sun are the Latin words Laus Deo meaning “Praise be to God” inscribed. Inside the monument is a plaque referencing God and a prayer to Him. As you proceed up into the structure on the twelfth landing is a prayer memorial from the city of Baltimore. On the twentieth is another offered by Chinese Christians. A presentation made by Sunday school children from New York and Philadelphia is on the twenty-fourth. Other inscriptions carved into the inside walls of the monument include “Holiness to the Lord”; “Search the Scriptures”; “The memory of the just is blessed”; “May Heaven to this union continue it beneficence”; “In God we trust”; and “Train up a child in the way he should go; and when he is old and he will not depart from it.” Yes, this is most definitely a secularist monument isn’t it? Oh, and by the way, in its only statement on the subject the Court, after a studious seven year investigation scouring every public and private document related to the matter, declared ours is indeed a Christian nation because it undeniably was founded upon Christian principles. Look up Holy Trinity Church vs. U.S. 143 U.S. 457, 2/29/1892. 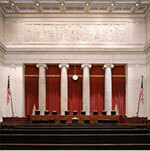 If you can’t visit a law library check it out here. Visit the Library of Congress, and the White House. They’re full of statues, paintings, murals, etc., all referring to a Christian heritage. Then there are those tens of thousands of grave markers at the Arlington Nat’l Cemetery with all those crosses or Stars of David engraved on them. Or do your eyes just need checking? Venture out to the National Mall, (you know taxpayer held real estate) where the National Christmas Tree, and trees from every state, and the National Hanukkah Menorah, are all lite up for the world to see too. I know that legal stuff can be pretty dry but I hope it makes a point. If someone wants to toss out the Christian influences on our government we would all have to say goodbye to some pretty important Constitutional legal protections. You see right up to the time of our nation’s founding there was no such thing as a secular nation. There were nations in those days that were based on one religion or another. Some on the Christian faith but none like ours- founded on the Calvinist Reformed Theology. I could go on with more monuments, statues, paintings, murals, etc., that confirm The Founders and all of the citizenry (until lately) were aware of and thankful for the Biblical roots of the country. It didn’t make things perfect. There were disagreements and set backs and failures over issues like slavery and women’s rights but the Scripture references written in the nations birth documents eventually led to the changes in racial and gender rights. For some God’s command that all races were created equal just wasn’t enough. It took a bloody civil war before the death of that satanic enterprise of slavery came about. Women’s full rights as citizens didn’t require armed conflict but it was a struggle to say the least. Just like slavery the tap root of change came from the example Christ gave when he walked the earth. I’ll conclude now but if you have a mind to give yourself a personal assignment check out all 50 of the individual state constitutions. Every one of them has at least one reference to God, Christ, and or the Holy Bible in it! The same goes for the original charters of most every college and university in the nation! Gingrich Newt, Rediscovering God in America, Reflections on the Role of Faith in our Nation’s History and Future, Thomas Nelson Publishers, ©2009. Are Teens Vulnerable to Go to Hell? All About Mary, Worship or Veneration?